Cover Love at Romance Lives Forever is a short intro to a book and includes a cover, blurb, buy links, and social media contacts for the author. 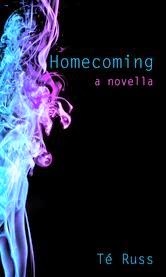 Today's featured book is Homecoming by Te Russ. Troy Hartford has finally returned to his small hometown in Texas, and the first person he runs into is Veronica Baker. He's amazed at the beautiful woman she's become. Veronica has been living her mundane life, making sure her father's business continues to thrive. She doesn't even realize that she's not truly living until Troy shows up. Neither of them can forget the one kiss they shared over a decade ago when they were teenagers, and seeing each other now has stirred up an attraction neither of them can deny. Welcome to RLF! You have a beautiful cover. I love those colors. I know! I love that cover.